Nikol Pashinyan, an outspoken oppositionist who served a jail term for his role in the 2008 post-election riot, has spoken about possible support to Raffi Hovannisian, an opposition leader who has claimed victory in the February 18 election officially won by the incumbent. In a statement released on Tuesday Pashinyan commented on his presence at the gathering of Hovannisian in Yerevan’s Liberty Square earlier that day. At what was described as a press conference in the square the official runner-up in the presidential race called on President Serzh Sargsyan to admit his defeat and start transferring power to the people. “The current political situation is more than clear. 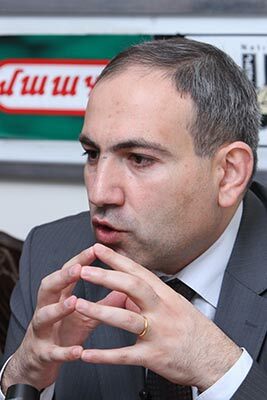 People trust the leader of the Heritage party, Raffi Hovannisian, who must present to the society his vision regarding the further developments,” said Pashinyan, an MP with the ANC faction, adding that he was ready to support, within the limits of his abilities, the steps aimed at achieving “real, system changes in Armenia and the establishment of democracy”. “My assistance to the further programs of Raffi Hovannisian will depend on their political and civil contents. Bringing the Armenian people to real victories is the goal that I have always served and will continue to serve,” concluded the oppositionist. Pashinyan has reportedly been on increasingly strained terms with the rest of the ANC over the latter’s recent policies of cooperation with a force previously allied with President Sargsyan’s ruling party. And the ANC, for its part, has been in apparent rivalry with Hovannisian’s Heritage Party over the opposition segment of the electorate lately.